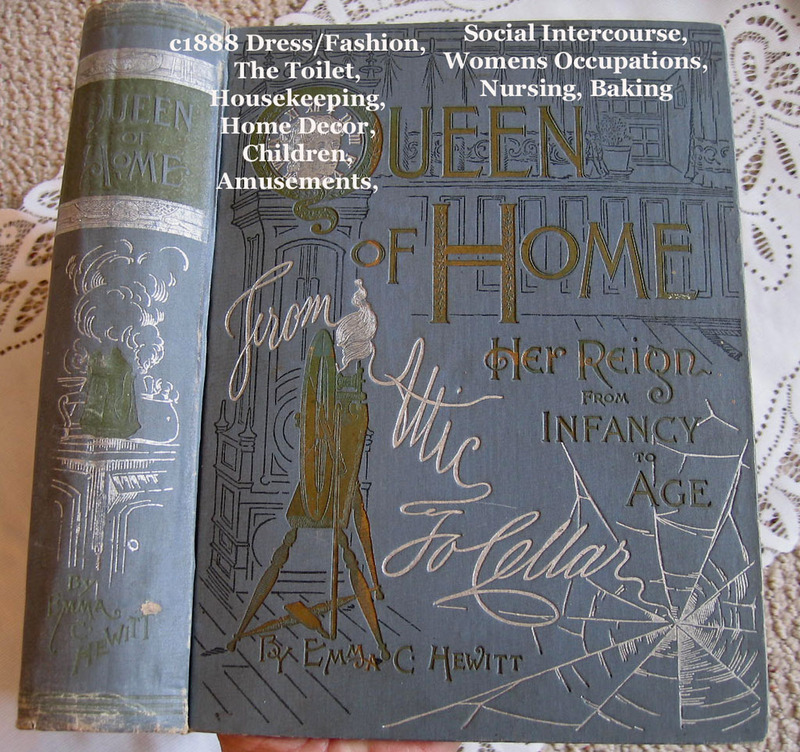 Queen of Home Her Reign from Infancy to Age Book. 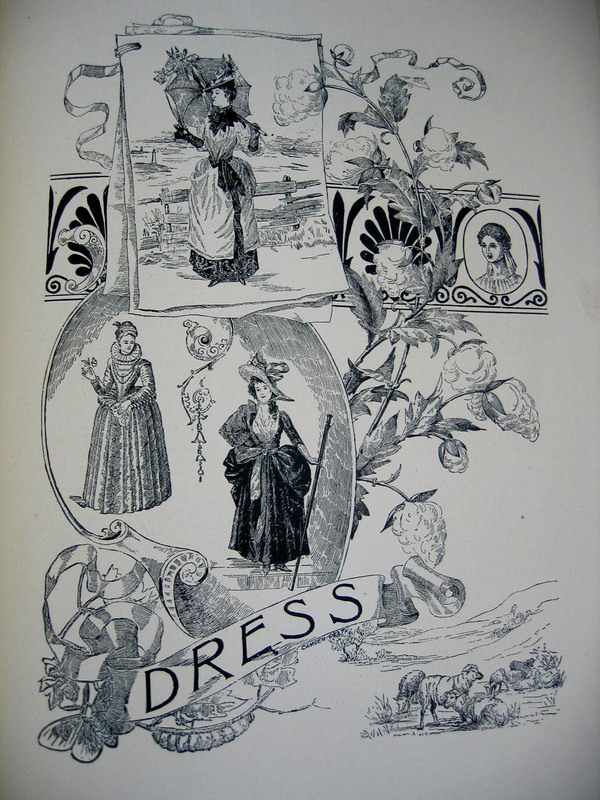 This exceptional circa 1892 book (first printed in 1888) is entitled "Queen of Home, Her Reign from Infancy to Age", and the author of Emma Churchman Hewitt. 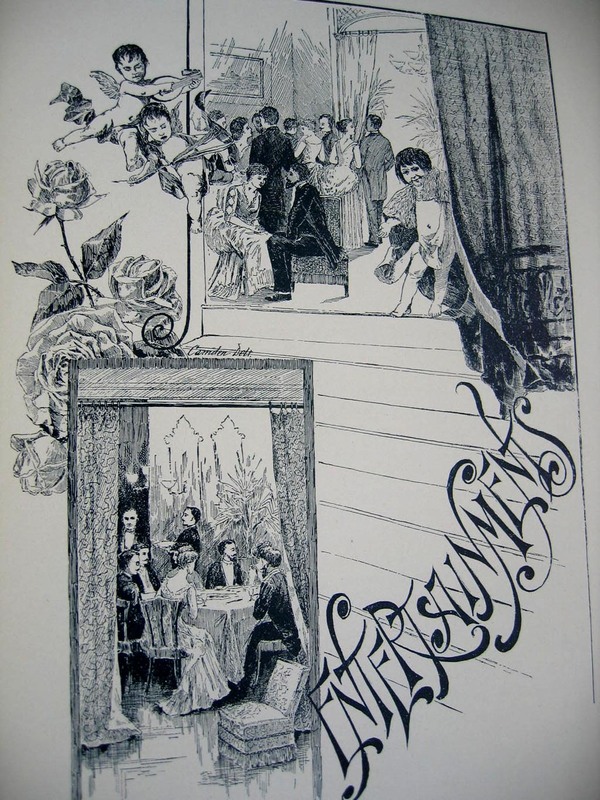 The inside contents are quite comprehensive, and entertaining as well, with gorgeous black and white illustrations. A fine gift items for Valentine's Day or Mother's Day indeed. The cover is a grey-blue hardbound cloth, with gilt and silver decoration. It depicts a home scene, with a grandfather clock, a spinning wheel, and home scenes. The spine is also decorated. This book is quite substantial, at 8 x 9.75 inches and very thick, 528 pages. It is very SCARCE, and a prize for any library or those who collect women's and etiquette books. 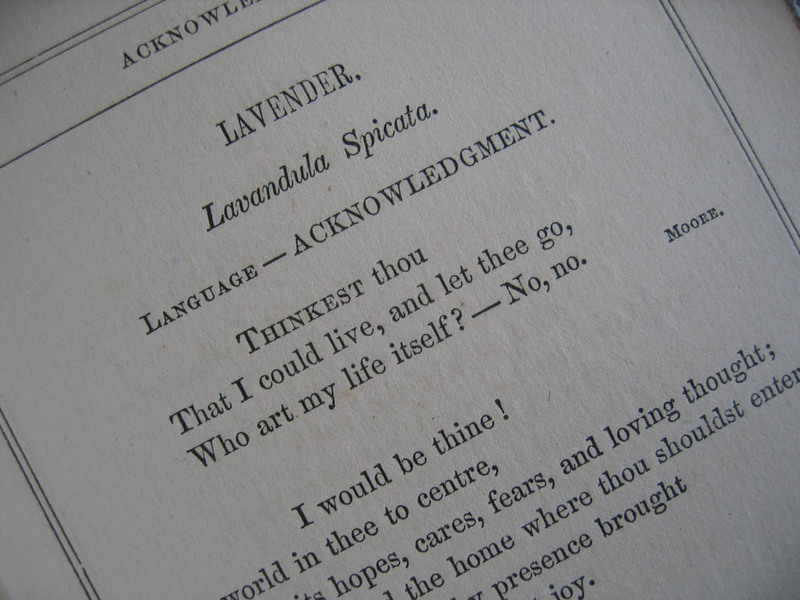 The front opens to a colored frontispiece, with Queen of Home in bold lettering. 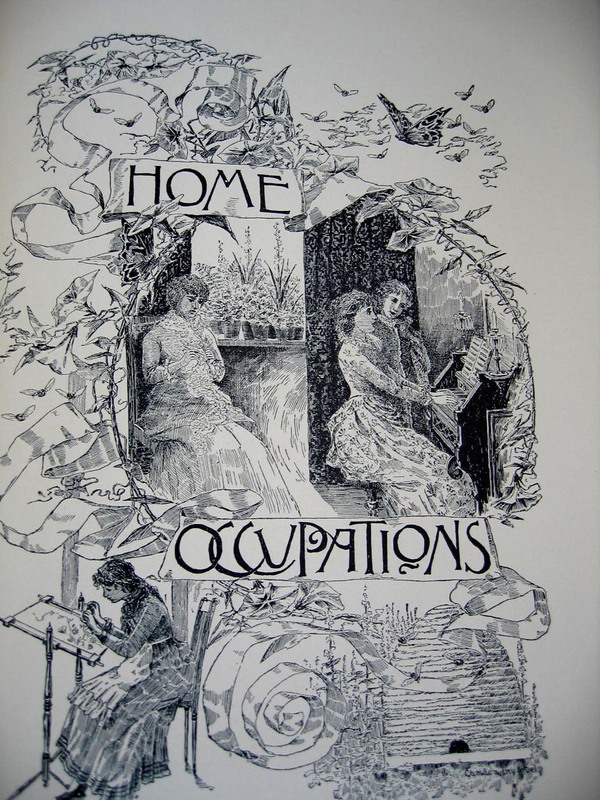 The title page goes on to tout: “From Attic To Cellar, twelve departments, treating of Home Occupations; Nursery; Home Training; Home Amusements; Social Relations; Entertainments; Library; Dress; Occupations for Women, including papers by eminent authorities on home decorations, infancy, and the sick-room. There are so many, many illustrations in this text, but we are limited to only 9 photos on Ruby Lane. So do ask for more if you like! 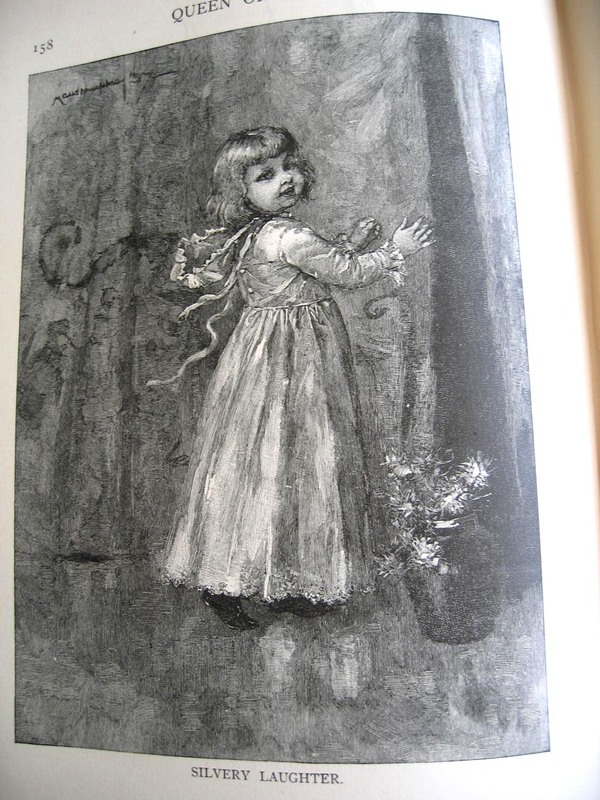 They are all grand, many full-page engravings, and others the chapter page with gorgeous illustrations, many with cupids. This book just goes on and on about corsets, the complexion, social interaction, just all things women should know and adhere to. It is amazing in its content, definitely a coffee table book to entertain! The inside is Very Good, clean with minimal wear. The text block is tight. I would think this was a cabinet book, as the wear is mostly confined to the cover board corners and spine. The cover boards ad spine have little wear, and still have the gilt and silver imprinting. It is a heavy book with exceptional illustrations. It’s a beautiful example of Americana, and a delight to read. We ship books inexpensively using USPS Media Mail insured, but can send at the Priority Mail rate. We do have book layaways, please inquire for terms.